Of the penalties charted over the first 162 games of the season, the Associated Press identified 156 involving contact with the head and neck. Almost once a game, an NFL player absorbs an illegal blow to the head or neck that could put his career – or worse – at risk. The NFL has been trying to prevent such blows over the past four years, targeting improper technique and making a point to penalize and fine players for hits that leave them and their opponents vulnerable. Yet an Associated Press review of penalties through the first 11 weeks of the season found those hits are still prevalent. The AP reviewed 549 penalties, 491 of which fell under the category of major infractions: unnecessary roughness, unsportsmanlike conduct, roughing the passer, face masks and roughing the quarterback. Of the penalties charted over the first 162 games of the season, the AP identified 156 involving contact with the head and neck — an average of .962 per game. Of those, 38 were for head-wrenching face masks, 25 were for horse collars and 93 were for hits to the head. Quarterbacks (40) and receivers (38) shared the brunt of those hits almost equally, with players at other positions absorbing the other 15 blows. The numbers can be interpreted in a variety of ways. The league declined comment, though it made a statement of sorts in the offseason when it decided against the 5 percent hike in minimum fines, as allowed for in the union contract, after determining players were adjusting to the rules. Defensive players acknowledged they have to do their part to make the game safer. “The face mask, that’s going to happen. The pass interference, those things are going to happen. 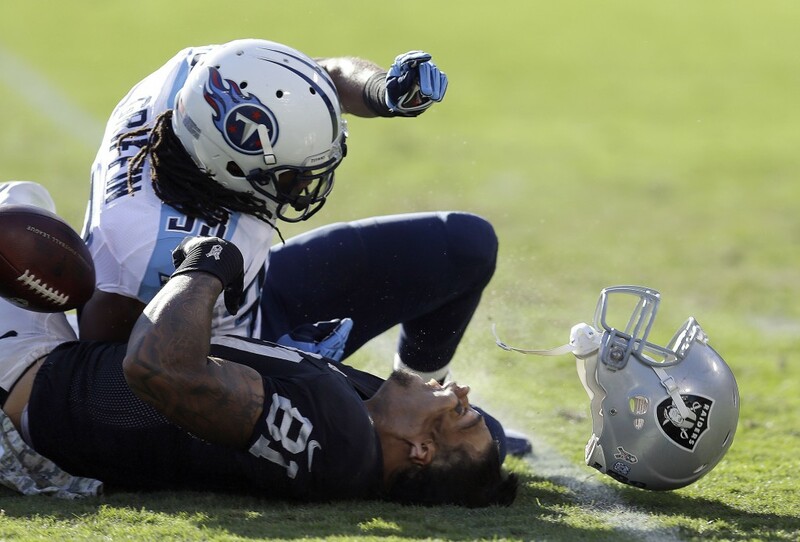 The stupid fouls, hitting the quarterbacks late and doing all the other stuff we’ve done, we have to eliminate it,” said Titans safety Bernard Pollard, who has been fined $62,000 this season. But the defenders also reiterated a long-held belief that they’re held to a different standard than their offensive counterparts. True to the defenders’ complaints, the AP review tallied 224 major infractions against the defense, with only 69 going against the offense. Similarly, penalties for low hits, which many thought would rise when defenders were forced to focus away from the head and neck, were relatively low — only 35. That small number included illegal cuts, chop and peelback blocks against the offense for hits on defenders — penalties the defensive players argue are called far too rarely and put their careers at as much risk as the above-the-shoulder hits. “The way offenses are playing now and the way running backs block now, I think it’s almost every play,” Broncos defensive tackle Terrance Knighton said when asked how often a defensive player’s legs get targeted. New England tight end Rob Gronkowski’s season ended abruptly Sunday with a knee injury when he took a low hit from Cleveland safety T.J. Ward. No penalty was called. Ward said he knows he can’t go for the high hit. 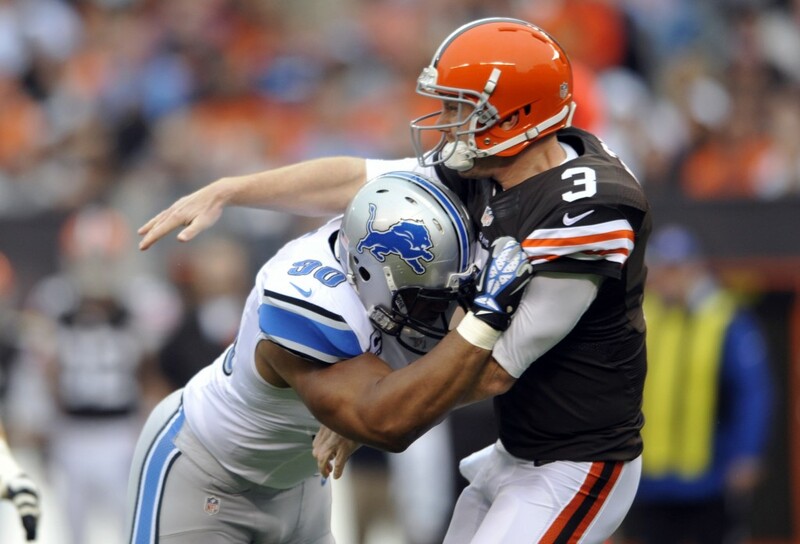 Of the 35 penalties for low hits, 10 came against the defense for hits to the quarterbacks. The league’s propensity for protecting the passer continues at almost every spot on the field. Over the first 11 weeks, there were 32 flags for infractions against quarterbacks that didn’t involve hits to the head or legs — for example, a late hit on a sliding quarterback. The NFL still makes a big splash out of suspensions and fines levied under the umbrella of protecting players. Ndamukong Suh, a multiple offender, got a $100,000 fine — largest in league history for on-field conduct — for his Week 2 low block on John Sullivan of the Vikings during an interception return. Whatever the mixed messages, the NFL appears satisfied with the way players are adjusting to the rules, given the league’s decision not to raise fine amounts. Total fines issued by the NFL have declined by 32 percent from 2009 to 2012 (668 to 451) and also decreased 4.5 percent between 2011 and 2012 (472 to 451). Fines for illegal hits on quarterbacks have declined 46.4 percent since 2009 (114 to 61). All of which points to a safer game — but a game that nevertheless, at least on average, puts at least one player in jeopardy in every game in every stadium every Thursday, Sunday and Monday.